On 26 October Russian President Putin planned for a discussion about the plans for establishing a Russian airbase in Belarus with his Belarusian colleague Lukashenka. They did not meet. Instead, a Russian general told the press that the base plans had been agreed on with the Belarusian side. The Belarusian defence ministry retorted that there was no political decision on the facility. The airbase is already two years behind schedule. Unilateral statements made by Russian officials throughout the whole of this period have concealed a lack of progress on the base. 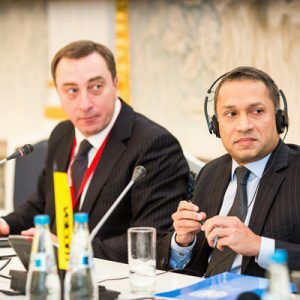 "Many years of cooperation between Minsk and Moscow failed to yield an efficient mechanism of joint defence," lamented Russian Nezavisimaya Gazeta daily. Meanwhile, the number of Belarusian officers studying in Russia has recently declined, as did the scale of major regular joint military exercise in September. Russia proposed the establishment of its airbase in Belarus in April 2013. Yet before the October election Lukashenka dismissed any such plans. He also accused Russia's ruling establishment of leaking fake information to the press. Lukashenka and Putin were expected to talk about the base at a summit in Astana in October this year. But after Astana, Belarusian officials continued to firmly oppose the airbase. The Belarusian defense minister Andrei Raukou and Foreign Minister Uladzimir Makei in late October criticised the idea of the Russian airbase. Furthermore, although the joint conference of the defence ministries of Belarus and Russia on 21 October discussed the Single System of Air Defence, it failed to touch upon the issue of the Russian airbase, though it would be an indispensable part of the system. Lukashenka categorically refuses to host an airbase. He wishes to keep guarding Moscow's sky, as he should in accordance with his alliance obligations, with the Belarusian armed forces. He continues to stop the airbase in the hope of increasing the economic benefit Belarus receives from Moscow. Given Minsk's firm position, Moscow again decided to change the plans. It already accepted moving the base away from the borders with NATO Members (from Lida or Baranavichy to Babruysk) as well as delaying its establishment. On 24 October, the chief of the operative directorate of Russia's Air and Space Forces, Alexander Lyapkin, speaking at a seminar in Moscow announced that Russia wants to deploy 12 fighter jets Su-27 and four helicopters Mi-8 in Belarus. That is half of what Russia demanded during the first discussions. Such flexibility raises questions about the strategic meaning of the base. After all it has been moved from one end of Belarus to another, and had its force deployment reduced by half. Moscow apparently wants to get the base in whatever form. Apparently it needs it not to resist NATO, but primarily for other purposes. By establishing a military base in Belarus, the Kremlin achieves another, primarily political goal, namely eliminating any vestiges of Belarusian neutrality which Minsk had built up in the past decade by distancing itself from numerous Russian policies (for example on Georgia and Ukraine) and looking for alternative partners. 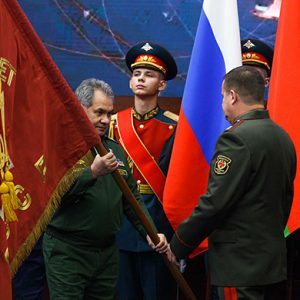 At a joint conference of the defence ministries of Belarus and Russia on 21 October, Russian military officials complained that despite 20 years of tight military cooperation between the two countries, the Union State of Belarus and Russia still lacked a clear-cut defence system. The conference also discussed the implementation of the agreements on the external borders of the Union State and the Single Air Defence System. The latter is in a pitiful condition. In 2013, Moscow declared the establishment of the Single Air Defence System of Belarus and Russia, but it does not currently function. Belarus in military terms is closely linked with Russia yet the declarations about these links and reality differ a lot. Thus, although formally Belarus buys almost of all the newest armaments which it cannot manufacture itself from Russia, that is only half true. First, Minsk cannot afford to buy major military systems despite the degradation of its military equipment. This year it acquired four Yak-130 trainer jets and plans to buy four more. The publicised deal on buying armoured personnel carriers from Russia for one battalion remains more a plan than a deal. These were the only major purchases the country made since independence. The only exception were surface-to-air missile systems. Moscow delivered these to Minsk only because Russia could not let Belarusian air defence defending Russian airspace decline. Second, after the Kremlin in the late 2000s and early 2010s refused to give Belarus some state-of-the-art arms like the Iskander short-range ballistic missile system, Minsk began cooperation with China in 2009 on designing new weapons. In 2012-2013, Minsk reportedly signed two agreements with China on designing two major arms system: a multiple launch rocket system (MLRS) and surface-to-air missile system. The former has already borne fruit, as Minsk this year demonstrated the Palanez MLRS. Declining Cooperation Volume Figures after Crimea? Moscow may be worried about Belarusian-Russian integration in the sphere of military education, too. Belarus sends many of its military specialists to train in Russia, in the last 17 years over 1,126 officers have been trained. However, the number of Belarusian officers sent to study in Russia after the Ukrainian crisis has rapidly declined. A year ago there were 447 such students, now there are only 374. Another example is joint military exercises. Belarus and Russia regularly held large-scale joint exercise, like Shchyt Sayuza​. Few commentaries mentioned the fact that this year significantly fewer forces had participated in this exercise. Four years ago, 12,000 troops and 450 vehicles demonstrated their skills in Shchyt Sayuza​​-2011. This year Minsk and Moscow committed only 8,000 soldiers and about 400 vehicles. Also for the first time ever, a Belarusian officer, the chief of Belarusian General Staff, Aleh Belakoneu, commanded the joint forces at the exercise. Evidently, Belarus maintains and increases its autonomy in the military sphere. Minsk will no longer clash with Moscow and it remains a partner of Russia. Yet the Belarusian government itself takes decisions. Although many, especially in the Russian media, try to prove the contrary, every noticeable aspect of military cooperation provides evidence of Minsk's increasing autonomy. Moscow wants to counter this tendency by getting Russian combat units placed in Belarus. The establishment of a Russian airbase will clearly increase Moscow's leverage over Belarus and its possibilities for more balanced and neutral policies.